Choices are very important in leadership. 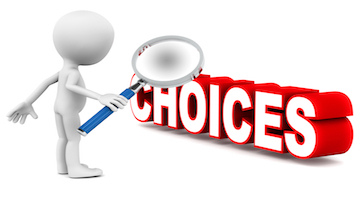 Making the wrong choice costs money and potentially damages the organization. The burden is on the leader for making effective and wise choices. Not making a decision is a choice. 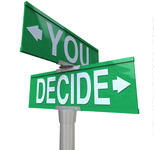 Sometimes, paralyzed by the gravity of the choice, leaders stall and can’t decide. Not making a choice is certainly a choice. What’s the impact of the decision on the organization? What’s the impact of the decision on relationships? What’s the impact of the decision on revenue…customer satisfaction…client engagement…stakeholder involvement…? Asking these questions before making a decision helps leaders recognize the consequences of the decision. Maybe asking those questions before not making a choice would be good, as well. Making wise, informed choices is the duty and delight of the leader. Making poor choices can cost a lot more and, certainly, waiting to make a decision increases the cost or impact of the problem to the culture or to the profit as the situation gets worse. The most difficult of choices typically centers on people issues, such as when to terminate the employee, when to give a salary increase, when to correct their behavior, when to challenge a nonparticipating board member, etc. Each of these scenarios causes leaders to shy away from confronting controversial issues. Pay the upfront cost and deal with the situation as soon as practical. That might be before you get the chance to confront someone on an issue. Waiting only complicates things and provides an opportunity for the conflict, if that’s the issue, to get worse. A small matter becomes nuclear over time. Delegate action items so you can free up your schedule and your mind to think effectively about complex leadership decisions. To decide or not…that’s the question.